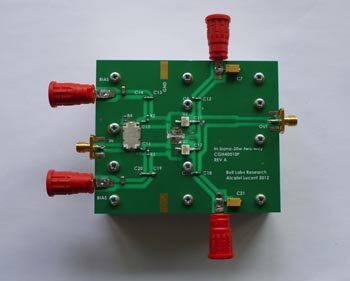 In novel 4G/5G cellular communication systems, it is required that the radio transmitter in general and power amplifier as its key part in particular operate with high efficiency over wide frequency ranges to provide multiband and multistandard operation. 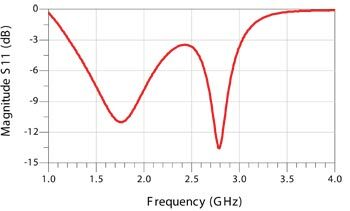 Besides, in these systems with increased bandwidth and high data rate using OFDM transmission mode, the transmitting signal is characterized by high peak-to-average power ratios due to wide and rapid variations of the instantaneous transmitting power. Therefore, it is very important to achieve high efficiency at maximum output power and at lower power levels typically ranging from −6 dB and less over a wide frequency bandwidth. Different 3GPP LTE Advanced bands for 4G/5G cellular systems with up to 40 MHz channel bandwidths are expected to be covered: tri-band (SMH, CLR, GSM) 0.7-0.9 GHz, tri-band (DCS, PCS, IMT) 1.8-2.1 GHz, dual-band (IMT & IMT-E) 2.1-2.6 GHz, or even multiband 1.8-2.6 GHz. By using GaN HEMT technology and innovative Doherty architectures, average efficiencies of 50-60% for output powers ranging from 5 to 50 W can be achieved that significantly reduces cost, size, and power consumption of the transmitters. Moreover, power-amplifier miniaturization and integration for small-cell applications are vitally needed keeping the same high-performance capability. 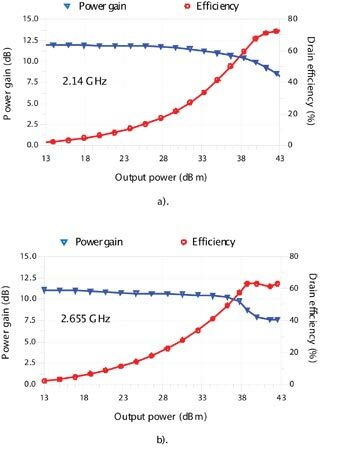 For a conventional Doherty amplifier with a quarterwave impedance transformer and a quarterwave output combiner, the measured power-added efficiency (PAE) of 31% at backoff power levels of 6-7 dB from the saturated output power of about 43 dBm was achieved across the frequency range of 1.5-2.14 GHz . To improve the broadband performance of a conventional Doherty amplifier, an output network can be composed of two quarterwave impedance inverters with reduced impedance transformation ratios . For a broadband combining, an output quarterwave transmission line with fixed characteristic impedance can be replaced by a multisection transmission line with different characteristic impedances and electrical lengths of its sections, which allow covering the frequency range from 2.2 GHz to 2.96 GHz . In this case, the broadband matching is realized by applying the simplified real frequency technique with the desired frequency-dependent optimum impedances. However, nonlinear optimization of the entire Doherty amplifier system makes the design enough complicated in terms of circuit simulation and results in a sufficiently large size of the final board implementation. This paper introduces and describes innovative Doherty amplifier architectures for different wireless applications, which allow high efficiency across wide frequency range and backoff output powers to be achieved using a simple transmission-line load network. To further maximize bandwidth efficiency, the broadband reactance-compensation transmission-line Class-E design approach for carrier and peaking amplifiers is used. Conventional design of a high-efficiency switchmode Class-E power amplifier requires a high QL-factor to satisfy the necessary harmonic impedance conditions at the output device terminal. However, if a sufficiently small value of the loaded quality factor QL is chosen, a high-efficiency broadband operation of the Class-E power amplifier can be realized by applying the reactance compensation technique. For example, a simple network consisting of a series resonant LC circuit tuned to the fundamental frequency and a parallel inductor provides a constant load phase angle of 50° in a frequency range of about 50% . This kind of a power amplifier requires an operation in saturation mode resulting in a poor linearity, and therefore is not suitable to directly replace linear power amplifiers in conventional base station WCDMA/LTE transmitters with non-constant envelope signal. However, to obtain both high efficiency and good linearity, such kind of nonlinear high-efficiency power amplifier operating in a Class-E mode can be used in advanced broadband transmitter architectures such as Doherty or EER (envelope elimination and restoration) with digital predistortion [5, 6]. Also, its broadband property is very useful for future software-defined radio platforms in microcell or macrocell applications based on a single-bit RF pulsed-train signal transmission. Usually, the bandwidth limitation in power amplifiers comes from the device low transition frequency and large output capacitance, therefore silicon LDMOSFET technology has been the preferred choice up to 2.2 GHz. As an alternative, GaN HEMT technology enables high efficiency, large breakdown voltage, high power density, and significantly higher broadband performance due to higher transition frequency and smaller periphery resulting in smaller input and output capacitances and less parasitics. Generally, it is very difficult to keep efficiency at high level over very wide frequency bandwidth. For a Class-E load network with shunt capacitance, a PAE above 50% was achieved within the frequency range from 1.9 GHz to 2.4 GHz . To increase high-efficiency frequency bandwidth, the broadband Class-E technique based on a reactance compensation principle with a combination of the series and shunt resonant circuits can be used . In this case, a PAE over 53% was observed across the frequency bandwidth of 2.1-2.7 GHz with output power variations from 9.3 W to 12.7 W at a supply voltage of 40 V .
Figure 1(a) shows the example of a reactance-compensation load network for Class-E power amplifier with shunt capacitance, which includes a series transmission line and a parallel resonant circuit. In this case, the reactance of the Class-E load network with shunt capacitance and series inductance varies similarly to that of the series resonant circuit with a positive slope, whereas the required negative slope is provided by the parallel resonant circuit. Selection of the proper characteristic impedance and electrical length of the series transmission line enables the magnitude of the two slopes to be made identical, so as to achieve a constant total reactance and phase of the load-network impedance Znet over a wide frequency range. As an example, the simulation results at the fundamental frequency show that the resistance ReZnet varies from 35 Ω at 30 MHz to 68 Ω at 70 MHz, as shown in Fig. 1(b) by curve 1, whereas the load-network phase varies between 27° and 40° in more than octave bandwidth from 33 MHz to 80 MHz (curve 2). It is also very important for high-efficiency Class-E approximation that the reactances at the second and higher-order harmonics will be capacitive, although they are not optimized across the entire frequency bandwidth. Figure 1 • Reactance-compensation Class-E circuit with lumped elements and transmission line and its performance. Generally, very broadband power amplifier design employs an input lossy LCR matching circuit to minimize the input return loss and output power variations over very wide frequency bandwidths with an output LC network to compensate for the device output reactance [10, 11]. As an alternative, to provide an input broadband matching over octave bandwidth, it is possible to use a multisection matching transformer consisting of stepped transmission-line sections with different characteristic impedances and electrical lengths . Such an input matching structure is convenient in practical implementation since there is no need to use any tuning capacitors. Figure 2 • Idealized circuit schematic of broadband Class-E GaN HEMT power amplifier. where Pout is the output power at the fundamental frequency, Vdd is the drain supply voltage, and Vsat is the saturation voltage defined from the device output current-voltage characteristics . In this case, the transmission-line parallel resonant circuit as a part of the broadband Class-E load network with a 25-Ω load is represented by the open- and short-circuit stubs replacing lumped capacitor and inductor, respectively, each having a characteristic impedance of 50 Ω and electrical length of 45° at 2.0 GHz. An additional series transmission line with low characteristic impedance having a quarter wavelength at the high bandwidth frequency is used to match an idealized 25-Ω load with a standard 50-Ω load. Figure 3 shows the simulation results for the small-signal S11-parameters versus frequency demonstrating the in-band return loss for a broadband Class-E power amplifier. Figure 3 • Simulated small-signal S11 versus frequency. As a result, an output power of more than 41 dBm with a power gain of around 10 dB was simulated for an input power of 31 dBm, as shown in Fig. 4(a). 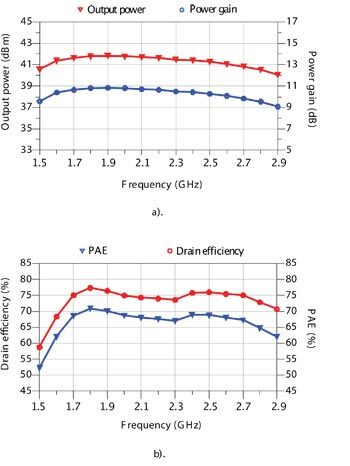 In this case, the drain efficiency over 73% and PAE over 67% were achieved across the required frequency range from 1.7 GHz to 2.7 GHz, as shown in Fig. 4(b). Previously, drain efficiencies greater than 60% were achieved between 1.8 GHz and 2.3 GHz with a 45-W GaN HEMT CGH40045F device using a distributed second-harmonic termination with short-circuit stubs . Figure 4 • Simulated results of broadband Class-E GaN HEMT amplifier. Figure 5 shows the test PCB board of the implemented broadband Class-E GaN HEMT power amplifier using a Cree CGH40010P device in a pill-type package. The input matching circuit, output load network, and gate and drain bias circuits (having bypass capacitors on their ends) are fully based on microstrip lines fabricated on a 20-mil RO4360 substrate according to their simulation parameters shown in Fig. 2. Only the width of a series microstrip line connected to the drain terminal was slightly increased to make it longer. Figure 5 • PCB board of broadband Class-E GaN HEMT amplifier. 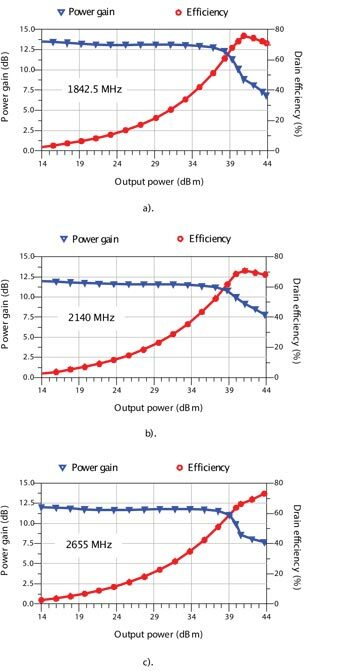 Figure 6 shows the measured results of a transmission-line broadband Class-E GaN HEMT power amplifier with an output power of 40.6±0.9 dBm and an average drain efficiency of about 68% (from 63% to 73%). In this case, a power gain of around 9.5 dB at a drain supply voltage of 24 V in a frequency bandwidth from 1.4 GHz to 2.7 GHz was achieved without any tuning of the input matching circuit and load network. Figure 6 • Measured results of broadband Class-E GaN HEMT amplifier. A multiband capability of the conventional two-stage Doherty amplifier, whose block schematic is shown in Fig. 7(a), can be achieved when all of its components are designed to provide their corresponding characteristics over the required bandwidth of operation. In this case, the carrier and peaking amplifiers should provide broadband high-efficiency performance when, for example, their input and interstage matching circuits are designed as broadband and the load network generally can represent a low-pass structure with two or three sections tuned to the required frequencies. For a multiband operation with the center frequency ratio at each of the frequency bands of 2 or greater, the input divider can be configured as a multisection Wilkinson power divider or coupled-line directional coupler. In a dual-band operation mode, an input power splitter can represent a ∏- or T-shape stub-tapped branch-line coupler composed of four dual-band quarterwave transmission lines, and an impedance inverter network introducing a 90° phase shift can be based on a ∏- or T-type transmission-line impedance-inverting section with proper selected transmission-line characteristic impedances and electrical lengths, where shunt elements are provided by the open-circuit stubs [13, 14]. Figure 7 • Block diagram of conventional and modified Doherty amplifiers. The delay transmission line at the input of the peaking amplifier can be constructed in a similar way as the multiband impedance transformer at the output of the carrier amplifier by allowing the phase of the signal transmitted through the carrier amplifier path to match the phase of the signal in the peaking amplifier path. However, it should be noted that it is not easy to design a multiband impedance transformer that provides two separate matching options simultaneously: first, to operate in a 50-Ω environment without affecting power-amplifier performance in a high-power region, and secondly, to provide an impedance transformation from 25 Ω to 100 Ω in a low-power region. The multiband output combiner required to combine the output powers from the carrier and peaking amplifiers and transform the resulting 25-Ω impedance to the standard load impedance of 50 Ω can be realized using two quarterwave transmission lines connected in series, with the characteristic impedance of the first transmission line equal to √25 Ω × 35 Ω = 29.58 Ω and the characteristic impedance of the second transmission line equal to √35 Ω × 50 Ω = 41.83 Ω for an intermediate impedance of 35 Ω. Generally, a simple two-stepped transmission-line impedance transformer can provide a two-pole response with a different characteristic impedance ratio and different electrical lengths of the lines of the transmission-line sections . 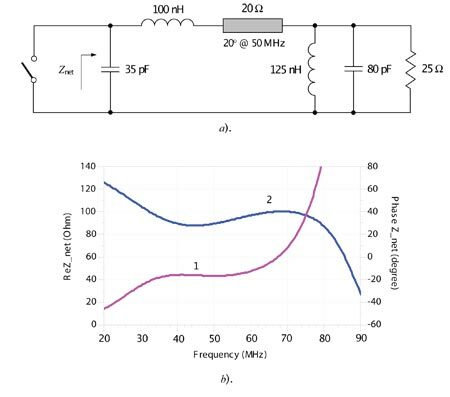 The classical two-stage Doherty amplifier has limited bandwidth capability in a low-power region since it is necessary to provide an impedance transformation from 25 Ω to 100 Ω when the peaking amplifier is turned off, as shown in Fig. 8(a), thus resulting in a loaded quality factor QL = √100 Ω / 25 Ω 2 1 = 1.73 at 3-dB output-power reduction level, which is sufficiently high for broadband operation. The parallel architecture of a two-stage Doherty amplifier with modified modulated load network, whose block schematic is shown in Fig. 7(b), can improve band properties in a low-power region by reducing the impedance transformation ratio by a factor of two . In this case, the load network for the carrier amplifier consists of a single quarterwave transmission line required for impedance transformation, the load network for the peaking amplifier consists of a 50-Ω quarterwave transmission line followed by another quarterwave transmission line required for impedance transformation, and the quarterwave transmission line at the input of the carrier amplifier is necessary for phase compensation. Both impedance-transforming quarterwave transmission lines, having a characteristic impedance of 70.7 Ω each, provide a parallel connection of the carrier and peaking amplifiers in a high-power region by parallel combining of the two 100-Ω impedances at their output into a 50-Ω load, with 50-Ω impedances at their inputs seen by each amplifier output. In a low-power region below output-power backoff point of −6 dB when peaking amplifier is turned off, the required impedance of 100 Ω seen by the carrier-amplifier output is achieved by using a single quarterwave transmission line with the characteristic impedance of 70.7 Ω to match with a 50-Ω load, as shown in Fig. 8(b). Figure 8 • Load-network schematics and broadband properties. 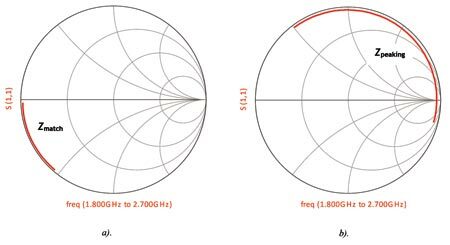 This provides a loaded quality factor QL = √100 Ω / 50 Ω 2 1 = 1, resulting in a 1.73 times wider frequency bandwidth, as shown in Fig. 8(c) by curve 1 compared with a conventional case (curve 2). Since the load network of the peaking amplifier contains two quarterwave transmission lines connected in series, an overall half-wavelength transmission line is obtained, and an open circuit at the peaking-amplifier output directly translates to the load providing a significant isolation of the peaking-amplifier path from the carrier-amplifier path in a wide frequency range. The input in-phase divider and phase-compensating transmission line can be replaced by a broadband coupled-line 90° hybrid coupler. From Fig. 8(c), it follows that the parallel Doherty architecture can provide a broadband operation within 25-30% around center bandwidth frequency with minimum variation of the load-network transfer characteristic. As a result, a dual-band operation can easily be achieved using this architecture, for example, in 1.8-GHz (1805-1880 MHz) and 2.1-GHz (2.11-2.17 GHz) or 2.1-GHz and 2.6-GHz (2.62-2.69 GHz) WCDMA/LTE frequency bands, respectively. Figure 9 shows the simulated circuit schematic of a dual-band parallel GaN HEMT Doherty architecture, where the carrier and peaking amplifiers are based on broadband transmission-line Class-E power amplifiers, whose idealized circuit structure is shown in Fig. 2. The input matching circuits and output load network are based on microstrip lines with their parameters corresponding to a 20-mil RO4360 substrate. The broadband 90° hybrid coupler is used at the input to split signals between the carrier and peaking amplifying paths. The electrical lengths of both offset and combining microstrip lines were optimized to maximize efficiency at saturated and backoff output power levels. Figure 9. Circuit schematic of dual-band parallel GaN HEMT Doherty amplifier. Figure 10 shows the simulation results for the small-signal S21-parameters versus frequency demonstrating the bandwidth capability of a parallel transmission-line GaN HEMT Doherty amplifier covering a frequency range from 2.0 GHz to 2.8 GHz with a power gain over 10 dB. In this case, an input return loss defined from the magnitude of S11 is less than 5 dB over the frequency bandwidth of 2.1-2.9 GHz. Figure 10 • Simulated small-signal S11 and S21 versus frequency. Figure 11 demonstrates the broadband capability of a parallel Doherty structure, where the carrier and peaking amplifiers are based on a broadband transmission-line reactance compensation Class-E technique. 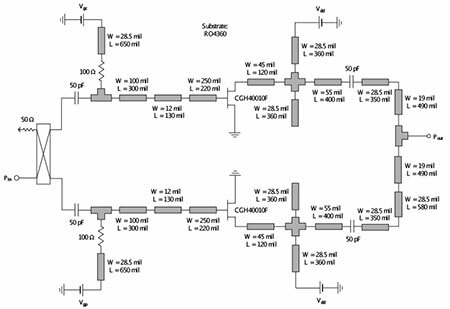 In an amplifier saturation mode with an input power of 36 dBm, a drain efficiency of around 70% with an average output power of more than 43 dBm and a gain variation of about 1 dB was simulated across the frequency range of 2.0-2.8 GHz, as shown in Fig. 11(a). 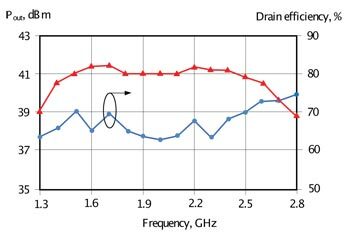 At the same time, high drain efficiencies over 50% at backoff output powers of 5-6 dB from saturation can potentially be achieved across the frequency range of 2.1-2.7 GHz, as shown in Fig. 11(b). This means that the practical implementation of a parallel Doherty power amplifier, the simulation setup of which is shown in Fig. 9, can provide a highly efficient operation in two cellular bands of 2.11-2.17 GHz and 2.62-2.69 GHz without any tuning of the amplifier load-network parameters, either with separate or simultaneous dual-band transmission of WCDMA or LTE signals. Figure 11 • Broadband capability of parallel Doherty amplifier. The large-signal simulations versus input power have been done at two center bandwidth frequencies of 2.14 GHz and 2.655 GHz with optimized circuit parameters to achieve maximum performance. Figure 12 shows the simulated large-signal power gain and drain efficiencies of a dual-band parallel transmission-line GaN HEMT Doherty amplifier using a 20-mil RO4360 substrate, with the carrier gate bias Vgc = −2.45 V, peaking gate bias Vgp = −7 V, and dc supply voltage Vdd = 28 V. In this case, a linear power gain of about 11 dB was achieved at an operating frequency of 2.655 GHz, whereas a slightly higher linear power gain of about 12 dB was achieved at lower operating frequency of 2.14 GHz. At the same time, drain efficiencies of 64% and 53% were simulated at backoff output powers of 39 dBm (4-dB backoff from saturated power of 43 dBm) and 37 dBm (6-dB backoff) at both center bandwidth frequencies, respectively. Figure 12 • Simulated results of dual-band parallel Doherty amplifier. 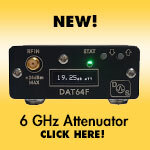 The dual-band transmission-line GaN HEMT Doherty amplifier was fabricated on a 20-mil RO4360 substrate. An input splitter represents a broadband coupled-line coupler from Anaren, model 11306-3, which provides maximum phase balance of ±5° and amplitude balance of ±0.55 dB across a frequency range of 2-4 GHz. Figure 13 shows the test board of a dual-band parallel Doherty amplifier based on two 10-W Cree GaN HEMT power transistors CGH40010P in metal-ceramic pill packages. The input matching circuit, output load network, and gate and drain bias circuits (having bypass capacitors on their ends) are fully based on microstrip lines of different electrical lengths and characteristic impedances according to the simulation setup shown in Fig. 9. Special care should be taken for device implementation process in order to minimize the input and output lead inductances of the packaged GaN HEMT device, which can significantly affect the amplifier performance such as power gain, output power, and drain efficiency. Figure 13 • Test board of dual-band GaN HEMT parallel Doherty amplifier. For a single-carrier 5-MHz WCDMA signal with a peak-to-average power ratio (PAR) of 6.5 dB, a drain efficiency of 45% with a power gain of about 10 dB and ACLR1 lower than −30 dBc at 2.14 GHz and a drain efficiency of 40% with a power gain of about 11 dB and ACLR1 around −30 dBc at 2.655 GHz were achieved at an average output power of 39 dBm. In both cases, optimization of the gate bias voltages for carrier (Class-AB mode) and peaking (Class-C mode) amplifiers were provided. Figure 14 shows the schematic diagram of an inverted Doherty amplifier configuration with an impedance transformer based on a quarterwave line connected to the output of the peaking amplifier. Such architecture can be very helpful if, in a low-power region, it is easier to provide a short circuit rather then an open circuit at the output of the peaking amplifier which depends on the characteristic of the transistor. In this case, a quarterwave line is used to transform very low output impedance after the offset line to high impedance seen from the load junction. 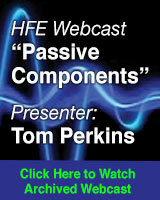 In particular, by taking into account the device package parasitic elements of the peaking amplifier, an optimized output matching circuit and a proper offset line can be designed to maximize the output power from the peaking device in a high-power region and approximate short-circuit condition in a low-power region . 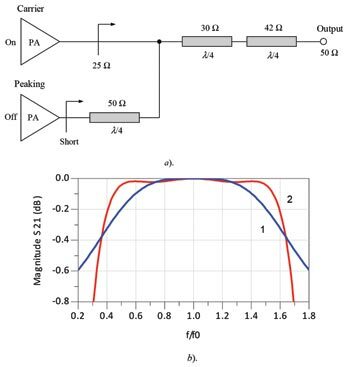 At a high-power level, for the matched phase difference between identical carrier and peaking amplifiers, the load impedance seen from each amplifier after the offset lines is equal to the standard 50-Ω load impedance. For a four-carrier WCDMA signal, a PAE of 32% with an ACLR of −30 dBc at an average output power level as high as 46.3 dBm was achieved for an inverted 2.14-GHz LDMOSFET Doherty amplifier. This provides a 9.5% improvement in efficiency and 1-dB improvement in the output power under the same ACLR conditions as for the balanced Class-AB operation using the same devices . Figure 14 • Schematic diagram of inverted Doherty amplifier. To better understand the operation principle of an inverted Doherty amplifier, consider separately the load network shown in Fig. 15(a), where the peaking amplifier is turned off. In a low-power region, the phase adjustment of the offset line with electrical length θ causes the peaking amplifier to be short-circuited (ideally equal to θ Ω), and the matching circuit in conjunction with offset line provides the required impedance transformation from 25 Ω to the optimum high impedance Zopt seen by the carrier device output at the 6-dB power backoff, as shown in Fig. 15(b). In this case, the short circuit at the end of the quarterwave line transforms to the open circuit at its input so that it prevents power leakage to the peaking path when the peaking transistor is turned off. 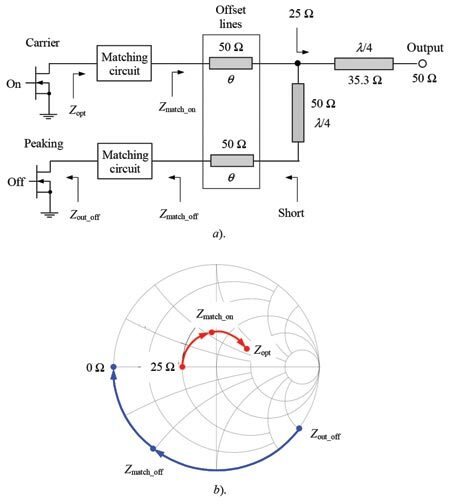 In a high-power region, both carrier and peaking amplifier are operated in a 50-Ω environment in parallel, and the output quarterwave line with the characteristic impedance of 35.3 Ω transforms the obtained 25 Ω to the required 50-Ω load. Figure 15 • Load-network schematic and impedances. Figure 16(a) shows the modified broadband load network of an inverted Doherty amplifier which consists of a two-section transmission-line output impedance transformer, where each quarterwave transmission line have a different characteristic impedance to match first the initial 25 Ω to intermediate 35.3 Ω and then to 50-Ω load. Such 25-to-50-Ω transformer provides a wide frequency range, as shown in Fig. 16(b) by curve 1. 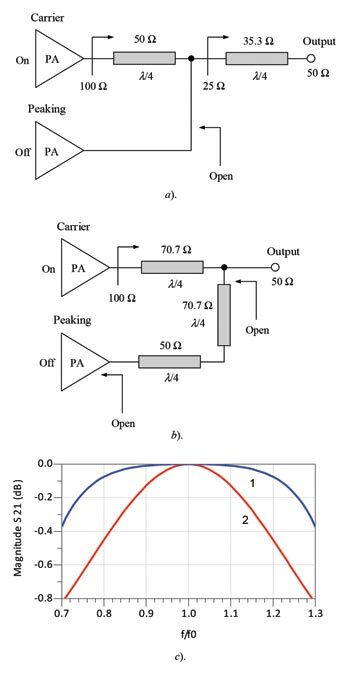 However, broader frequency range with flatter frequency response can be achieved with a quarterwave open-circuit stub connected at the input of the two-line transformer when a peaking amplifier is turned off, as shown in Fig. 16(b) by curve 2, resulting in more than octave bandwidth in a low-power region at output power levels less than −6 dB backoff point. In this case, it is assumed that the output matching circuit of the carrier amplifier provides ideally a broadband impedance transformation from 25 Ω to 100 Ω or close seen by the device multiharmonic current source. At the same time, broadband performance is also provided in a high-power region when both carrier and peaking amplifiers are turned on. Figure 16 • Load-network schematic and broadband properties. Figure 17 shows the simulated circuit schematic of a tri-band GaN HEMT Doherty amplifier configuration, where the carrier and peaking amplifiers using Cree CGH40010 GaN HEMT devices are based on the same broadband transmission-line Class-E power amplifiers, whose idealized circuit structure is shown in Fig. 2, and the broadband load network corresponds to the impedance-transforming structure shown in Fig. 16(a). The input matching circuits and output load network are based on microstrip lines with their parameters corresponding to a 20-mil RO4360 substrate. However, since it was found that, when the broadband Class-E power amplifier as a carrier amplifier is turned off, a short-circuit condition is achieved at the input of a series 35-Ω transmission line having a quarter wavelength at high bandwidth frequency to match with a 50-Ω load, as shown in Fig. 2, such a quarterwave transmission line was removed from the load networks of both the carrier and peaking amplifiers. As result, the overall combining load-network is significantly simplified, and only a small optimization of the electrical lengths of the short- and open-circuit stubs in the load networks of each carrier and peaking amplifiers is required to achieve broader frequency response. The broadband 90° hybrid coupler is used at the input to split signals between the carrier and peaking amplifying paths and provide a 90° phase shift at the input of the carrier amplifier across the entire frequency bandwidth. Figure 17 • Circuit schematic of tri-band GaN HEMT inverted Doherty amplifier. The impedance conditions at different points of the load network of the peaking amplifier when it is turned off are shown in Fig. 18, where Zmatch shown in Fig. 18(a) indicates a low reactance at the output of a Class-E load network with short- and open-circuit stubs across the required frequency range from 1.8 to 2.7 GHz, having nearly zero reactance at high bandwidth frequency of 2.7 GHz and increasing capacitive reactance when operating frequency reduces to 1.8 GHz. At the same time, by using a series transmission line of a quarter-wavelength long at high bandwidth frequency, an open-circuit condition is provided at higher bandwidth frequencies with sufficiently high inductive reactances at lower bandwidth frequencies, indicating by Zpeaking shown in Fig. 18(b). Hence, the broadband performance of such an inverted Doherty structure can potentially be achieved in a practical realization. Figure 18 • Impedances for peaking amplifier. 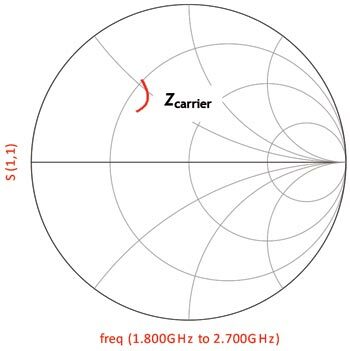 Figure 19 shows the frequency behavior of the impedance Zcarrier seen by the carrier device, as shown in Fig. 17, which has an inductive reactive component required for a high-efficiency Class-E operation and its real component slightly varies between 17 Ω and 22 Ω. This means that, taking into account the device output shunt capacitance of 1.3 pF and series bondwire inductor of about 1 nH, the impedances seen by the device multiharmonic current source at the fundamental across the entire frequency bandwidth of 1.8-2.7 GHz can be increased up to around 50 Ω, which is high enough to achieve high efficiency at backoff output power levels. In this case, the device output capacitance and bondwire inductor constitute a low-pass L-type matching section to increase the load impedance seen internally by the device multiharmonic current source at the fundamental. Figure 19 • Impedance for carrier amplifier. 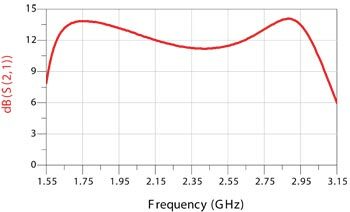 Figure 20 shows the simulation results for the small-signal S21-parameters versus frequency demonstrating the bandwidth capability of a modified inverted transmission-line GaN HEMT Doherty amplifier, which covers a frequency range of 1.6-3.0 GHz with a power gain over 11 dB. Figure 20 • Simulated small-signal S21 versus frequency. Figure 21 shows the simulated large-signal power gain and drain efficiencies of a transmission-line GaN HEMT tri-band inverted Doherty amplifier based on a 20-mil RO4360 substrate, with the carrier gate bias Vgc = −2.45 V, peaking gate bias Vgp = −7.45 V, and dc supply voltage Vdd = 28 V. In this case, a linear power gain of about 11.5 dB was achieved at higher bandwidth frequencies of 2.655 GHz and 2.14 GHz, whereas a slightly higher linear power gain of about 13 dB was achieved at lower bandwidth frequency of 1842.5 MHz. At the same time, the drain efficiencies of 71.5%, 69.0%, and 64.0% at backoff output powers of 40 dBm (4-dB backoff from saturated power of 44 dBm) and 59.0%, 57.0%, and 53.5% at backoff output powers of 37 dBm (6-dB backoff) were simulated at center bandwidth frequencies of 1842.5 MHz, 2140 MHz, and 2655 MHz, respectively. Here, the drain efficiency points near 4-dB backoff output power at low bandwidth frequency of 1842.5 MHz and at medium bandwidth frequency of 2.14 GHz are clearly seen, while high efficiency maintains almost constant at high output powers at high bandwidth frequency of 2.655 GHz. 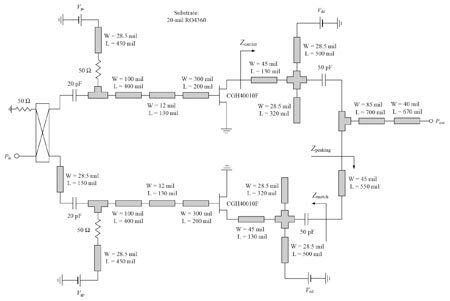 Figure 21 • Simulated power gain and drain efficiencies of tri-band inverted Doherty amplifier. 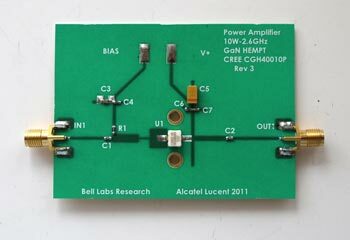 The tri-band transmission-line GaN HEMT Doherty amplifier was fabricated on a 20-mil RO4360 substrate. An input splitter represents a broadband coupled-line coupler from Anaren, model X3C17A1-03WS, which provides maximum phase balance of ±5° and amplitude balance of ±0.5 dB across a frequency range of 690-2700 MHz. Figure 22 shows the test board of a tri-band inverted Doherty amplifier based on two 10-W Cree GaN HEMT power transistors CGH40010P in metal-ceramic pill packages. The input matching circuit, output load network, and gate and drain bias circuits (having bypass capacitors on their ends) are fully based on microstrip lines of different electrical lengths and characteristic impedances according to the simulation setup shown in Fig. 17. Special care should be taken for device implementation process in order to minimize the input and output lead inductances of the packaged GaN HEMT device. Additional tuning has been done in the input matching circuits to maximize power gain over the entire frequency range. Figure 22 • Test board of triband GaN HEMT parallel Doherty amplifier. For a single-carrier 5-MHz WCDMA signal with a PAR of 6.5 dB, the drain efficiencies of 58%, 50%, and 42% at an average output power of 38 dBm with a power gain of more than 11 dB were achieved at operating frequencies of 1.85 GHz, 2.15 GHz, and 2.65 GHz, respectively, with ACLR1 measured from −32 dBc at 1.85 GHz to −37 dBc at 2.65 GHz. The gate bias voltages for carrier (Class-AB mode with a quiescent current of 100 mA) and peaking (Class-C mode) amplifiers were the same for all three frequencies. Generally, such a tri-band inverted Doherty amplifier can be used for concurrent signal transmission in two- or three frequency bands, however the total average power needs to be reduced to satisfy the corresponding linearity requirements. Andrei Grebennikov is with RFaxis, Irvine, Calif. He wrote this article when he was employed with Bell Labs, Alcatel-Lucent, Ireland. 1. K. Bathich, A. Z. Markos, and G. Boeck, “A wideband GaN Doherty amplifier with 35% fractional bandwidth,” Proc. 40th Europ. Microwave Conf., pp. 1006-1009, 2010. 2. K. Bathich, D. Gruner, and G. Boeck, “Analysis and design of dual-band GaN HEMT based Doherty amplifier,” Proc. 6th Europ. Microwave Integrated Circuits Conf., pp. 248-251, 2011. 3. G. Sun and R. H. Jansen, “Broadband Doherty power amplifier via real frequency technique,” IEEE Trans. Microwave Theory Tech., vol. MTT-60, pp. 99-111, Jan. 2012. 4. J. K. A. Everard and A. J. King, “Broadband power efficient Class E amplifiers with a non-linear CAD model of the active MOS device,” J. IERE, vol. 57, pp. 52-58, Mar. 1987. 5. D. Kang, D. Kim, and B. Kim, “Broadband HBT Doherty power amplifiers for handset applications,” IEEE Trans. Microwave Theory Tech., vol. MTT-58, pp. 4031-4039, Dec. 2010. 6. I. Kim, Y. Y. Woo, S. Hong, and B. Kim “High efficiency hybrid EER transmitter for WCDMA application using optimized power amplifier,” Proc. 37th Europ. Microwave Conf., pp. 182-185, 2007. 7. H. Xu, S. Gao, S. Heikman, S. I. Long, U. K. Mishra, and R. A. York, “A high-efficiency Class-E GaN HEMT power amplifier at 1.9 GHz,” IEEE Microwave and Wireless Comp. Lett., vol. 16, pp. 22-24, Jan. 2006. 8. A. Grebennikov, RF and Microwave Power Amplifier Design, New York: McGraw-Hill, 2004. 9. 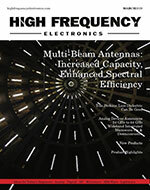 M. P. van der Heijden, M. Acar, and J. S. Vromans, “A compact 12-watt high-efficiency 2.1-2.7 GHz Class-E GaN HEMT power amplifier for base stations,” 2009 IEEE MTT-S Int. Microwave Symp. Dig., pp. 657-660. 10. Y.-F. Wu, R. A. York, S. Keller, B. P. Keller, and U. K. Mishra, “3−9-GHz GaN-based microwave power amplifiers with L-C-R broad-band matching,” IEEE Microwave and Guided Wave Lett., vol. 9, pp. 314-316, Aug. 1999. 11. K. Krishnamurthy, D. Green, R. Vetury, M. Poulton, and J. Martin, “0.5-2.5, 10 W MMIC power amplifier in GaN HEMT technology,” 2009 IEEE Compound Semiconductor Integrated Circuits Symp. Dig., pp. 1-4. 12. J. Kim, F. Mkadem, and S. Boumaiza, “A high efficiency and multi-band/multi-mode power amplifier using a distributed second harmonic termination,” Proc. 40th Europ. Microwave Conf., pp. 1662-1665, 2010. 13. H. Zhang and K. J. Chen, “A stub tapped branch-line coupler for dual-band operations,” IEEE Microwave Wireless Compon. Lett., vol. 17, pp. 106-108, Feb. 2007. 14. 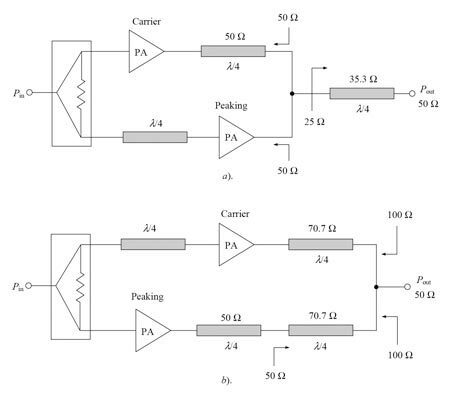 W. Chen, S. A. Bassam, X. Li, Y. Liu, K. Rawat, M. Helaoui, F. M. Ghannouchi, and Z. Feng, “Design and linearization of concurrent dual-band Doherty power amplifier with frequency-dependent power ranges,” IEEE Trans. Microwave Theory Tech., vol. MTT-59, pp. 2537-2546, Oct. 2011. 15. C. Monzon, “A small dual-frequency transformer in two sections,” IEEE Trans. Microwave Theory Tech., vol. MTT-51, pp. 1157-1161, Apr. 2003. 16 A. Grebennikov and J. Wong, “A dual-band parallel Doherty power amplifier for wireless applications,” IEEE Trans. Microwave Theory Tech., vol. MTT-60, pp. 3214-3222, Oct. 2012. 18. S. Kwon, M. Kim, S. Jung, J. Jeong, K. Lim, J. 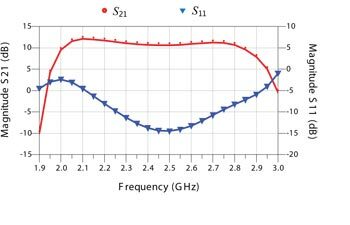 Van, H. Cho, H. Kim, W. Nah, and Y. Yang, “Inverted-load network for high-power Doherty amplifier,” IEEE Microwave Mag., vol. 10, pp. 93-98, Feb. 2009.